"Who needs chrome, paryen? Raw meat is where it's at now. Mother Nature always did it best – she just needed a little help. Get down to the black clinic, dyadooshka, and you can be 15 again. That is, if you still want to be human at all . 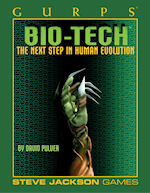 . . "
Introducing the technology of the next century: biotech! Upgrade your old body with steroids and smart drugs, transplants and viral nano . . . or just get a new one. Maybe you don't think being human is so great? Then improve on nature with eugenics and gene-fixing, or just go parahuman: Why admire cats if you can be one? The technology's changing fast, but you'll have lots of time to get used to it – death is a temporary inconvenience with cryonics, cloning and braintapes. And who needs silicon and steel? Biotronics and biomimetics are where it's really at! Welcome to the post-human age. Have you upgraded your genetics this year? You can find a revised and expanded treatment of these topics, updated for Fourth Edition rules, in the newest edition of GURPS Bio-Tech. 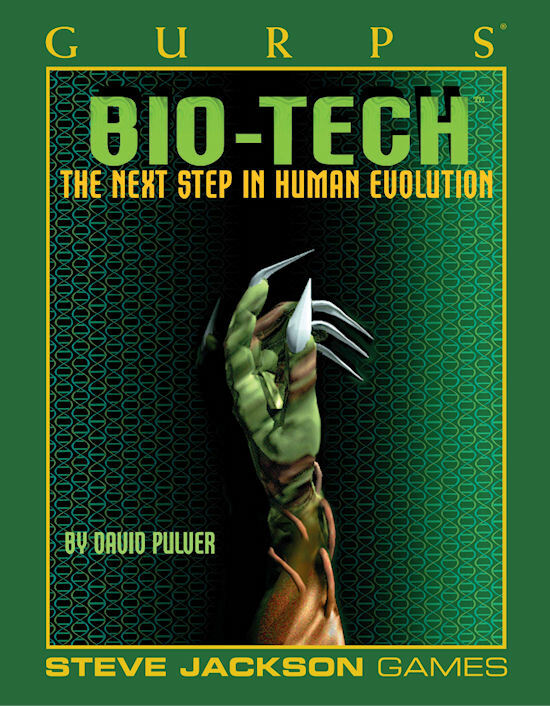 GURPS Bio-Tech – Revised, expanded, and updated for Fourth Edition, this book replaces the Third Edition version of Bio-Tech. GURPS Uplift – Of the thousands of races in a galaxy full of aliens, ours is the only one that claims to have evolved on its own, without genetic engineering by a Patron species. With its own new clients – genetically modified dolphins and chimpanzees – upstart humanity faces a jealous universe. GURPS Blue Planet – A place where corporate greed and human desperation ravage an alien ecology, threatening to plunge humanity into a war of survival with an ancient legacy.